So the promised update has happened overnight, thanks to Maven, Scoutpost, and LotteryTicket for staying up and discussing all the updates. This is a grid of 16 picture frames and a 'Hub' link. As you can see all but one of the question marks are white with the last one being red. It appears that this arrangement was 17 picture frames to start with, but one was removed during the night. According to Smokey Cup on the DarkUFO discussion the 14th frame isthe one that has been removed as it was an exact duplicate. Appearing to be a promotional poster for a club night on Sundae(sic) the 16th of August, presented by "Dharma Initiative", in the background are 9 Dharma symbols, and the image of the leg and foot has four toes. If you go to the myspace link at the bottom of the page you see lots of information. Firstly a new venue address, an email address to get put on the guest list, and also that there will be a special guest DJ'ing. Looking at the Twitter site for Thee Mike B (note two ee's not three like on the poster) it says the special guest will be John Locke. These people are real club night organisers and it will be interesting to see what will happen at the event. If anyone is going please let us know by emailing the admins. The new address on the myspace site is interesting as the original address on the poster appears to be for the Holywood walk of fame where Judy Garland's star is located. Also Steve Aoki's Twitter page shows a reference to Season 5 Episode 11 which is directed by Bobby Roth, who also directed Season 3's episode "The Man Behind The Curtain". The Wizard of Oz link is made again in regard to Lost. 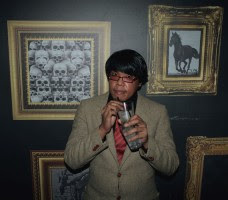 Matt D has emailed us to say that he was browsing through the Dim Mak blog page and came across a link for Style Shark (WARNING - some adult content), which is an online magazine with photographs from club nights. When browsing through the archive of the site he found this picture which appears to show the picture frames used on the new DCaaPB web site. This could just be coincidence, and the frames used are stock images of frames that can be freely used, but the photo is quite amusing and reminds me of Duane Dibley from the BBC TV series Red Dwarf. Further Update - It looks like Cobra Snake, that is mentioned on the poster, is also a club photographer and it may be that after the club night event that the Cobra Snake website may have photographs for us to view. Has anyone figured out what the Dharma logos are in the background of the poster ? The centre one seems to be a question mark. 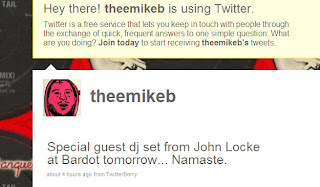 I've updated the already very long post with some interesting information from Matt D.
"Special guest dj set from John Locke at Bardot tomorrow... Namaste." 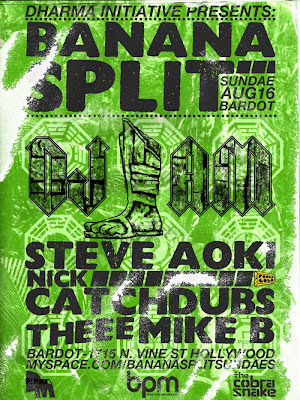 Probably nothing but I noticed that on every other Banana Split event poster the address for Bardot is 1737 N. Vine St but on this one it's 1715..? A few people on the DarkUFO site are saying that the Thee Mike B picture on the BananaSplitSundaes MySpace page is Greg Grunberg, I can see the likeness but I don't think he is. I just realized I posted this in a dead thread. MikeB and a LAX connection? I tried to get up at 3 am but it didn't happen. So help me if Terry O'Quinn shows up at that club tonight, I'm gonna go bananas...I wanted him to show up at Comic Con. oh well, no complaints. That would be cool, but I wonder where this will lead after tonight? Also, the quote on Ronie Midfew must refer to this "game"- 15 will be lost, the 16th will be found. Wonder what that means? I sorta kinda saw this coming back in January, but never envisioned a rapping messianic John Locke. Maybe the island has a Lost Hatch with the mirror ball hanging from the ceiling and of course, a smoke machine. thin said...and of course, a smoke machine. I wonder how long the hunt will take, will we get a new clue for the next 15 or 16 weeks ? That would take us close to, but not right up to the new season. Lost University starts up next month though, I wonder if they'll have both these things running simultaneously? It might be hard to find the time to do both. 16 weeks sould take us to the weekend of Dec. 5th & 6th. I thought that Lost University started on Dec. 8th when the dvds come out. It looks like this "hunt" will be fun and will definitely keep us busy and entertained. The lure of a possible Terry O'Quinn sighting is exciting, but I'm just not the type of person who goes to Hollywood clubs at midnight! LOL There seems to be plenty of others who will be going and fill us in. That's right Sayid's girl...I was thinking about enrollment- that's in September. So if you figured on the calendar right, I guess this would take us to LU and then we do LU until S6 starts. Don't guess I'll wait up til midnight tonight to see what is posted, I'll have to wait until tomorrow. I'm ready for the pace to pick up on this...or at least to know a little what we're working toward. I just love that Darlton really appreciates us fans and want to keep us together as a group one more long hiatus by keeping us busy with this hunt and LU! Thank you Darlton! I love to head bang with my walker! Sorry if these have been mentioned before. Thin, yes it is mentioned on the main page as the 1715 number does seem important, I don't think it is a simple mistake. No problem in talking about anything, it's getting interesting ! My internet was out this morning,so I missed the opening action.I was able to get online about an hour ago.Reading the comments was like fast forwarding through a movie. It seems like there will be fun,fun,fun,till Lost returns. Those old frames remind me of the ones that changed, when Miles went ghosting at Grandma's. Hey! Finally checking in after a whole day of no internet. I will have more time to mess around with all this tomorrow, have a good night everyone! You can follow Hollywood_Bob on Twitter. He's a poster on DarkUFO's forum and is going to Bardot tonight. They open in 1/2 an hour. Hope this Hollywood Bob gets in! He's arrived and standing in line. Posted a twitterpic. He says there are 15 people in line and he's at the end of it. Sayid'sgirl: You are following him, too. Should I continue posting updates here? Some regular club goers show up. Looks like it's just you and me tonight maven. I expected some west coasters tonight. It's not to late this time. Is Lottery Ticket in the US? I'm not a regular, but I'm here. Hollywood Bob is a hero! Funny thing is I was on Google maps today looking for the bardot. Welcome. Do you twitter? Are you following Hollywood_Bob? Hi, Thunderstorm! I think Lottery Ticket is in Central Time. Capitol Records Building across the street. "The line is getting funnier with these Hollywood club chicks starting to mix with the Losties." They're going in! Some poor dude has to check IDs. This is from Dark's forum. He posted a picture of the same Dharma Logo as Hollywood Bob from a different angle: http://img35.yfrog.com/i/10rg.jpg/ It looks like a turntable? No, I don't twitter but I am following Hollywood Bob just from the webpage. Looks like a turntable on the logo. He took a blurry shot of the DJ booth. Says nothing out of the ordinary inside. You've got a point. It's been awhile since I've been out. Says there's around 30, but only one of interest is the ship: could be Black Rock. Bob says you can tell the Losties from the regular crowd. unfortunately my brain is begining to melt. I'll look forward to your posts in the morning maven. Hatch at the DJ Booth? Good night. I'll keep updating his tweets here until I fade, too! Hey I'm checking in finally. Went to the grocery store and had to unload and put away etc. haha what a contrast to the partiers at the Bardot! Ok so I need to follow Hollywood_Bob and Jonathan Zuniga? is that all so far? Yep, Scoutpost. Hollywood Bob is updating much more often. He's the one to follow. I wish he would've taken more pictures of the LOST people and the regular clubbers...sounds like mixing the 2 is/was hilarious. Yeah you'd think with a picture of the Black Rock and a hatch in there that they'd have some Dharma beer! Even the frame of the ship picture matches the Black Rock one. Maybe that's one of the things in the empty pic frames? "Music is awesome... A lot of people hanging out waiting for something to happen. My guess is midnight." Wonder if something is happening, or maybe nothing is happening. Haven't seen a tweet from Hollywood Bob in a while now. Yeah, Lottery Ticket is here, too! From Jonathan Zuniga: DJ AM Dharma Jumpsuit and Four Toed Statue logo. Sick music!! LOL...Scoutpost...why don't I let you post the updates for a while. Let me know when you want me to take over. haha- sure Maven...the tweets were coming less frequently, but I'm sure it will pick up once things start to happen. he just posted a video! Video! Hope his battery does die! Are we thinking that something happening at midnight? It's Bob's opinion...that's all we've got to go on now. LT- Well that's just a "feeling" Hollywood Bob has, don't think there's any official "when" things are going to start. Sterling Beaumon is at Bardot right now and is being herded around by the ARG people. ok Zort- you post updates from jackshannon and I'll post them from Hollywood Bob...unless I get behind and then maven can pick up. yeah...how did they get Sterling in there?! don't worry about it maven! if we double post too much we can delete! Please allow 3-4 weeks delivery. No edition number requests can be fulfilled and each print will be shipped individually, so we can cannot combine shippi ng costs. Due to the fragile nature of hand-applied screen printing, these posters are promised in mint to near mint condition. Small differences in coloring and ot her minor defects are part of the uniqueness of these art pieces. Due to the limited nature o f this project, here will be no refunds, exchanges or replacements. Customer Service inquiries can be sent to TGCustomerService@gmail.com. This is fabulous! "Sale Starts Soon". WHEN? The first piece of artwork is Hurley related and has all kinds of memorable Hurley moments depicted in it. It will cost $50. So each poster will be character centric? 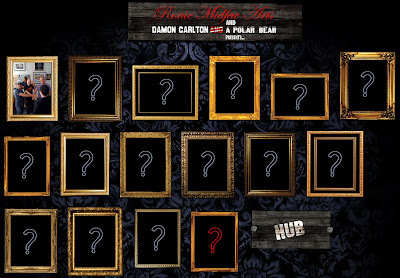 So this "hunt" is really just releasing each artist's print? Are they all $50 each? Is money going to charity? LT- I wonder...but don't really know. Maybe so. good questions maven. I wonder if the $$ is going to the artists? me too, the art is cool, but it's been such a ploy! it says "16 designers and artists were commissioned..." wonder what all kind of artwork they'll have? Hollywood Bob posted two websites but the other one LostArtUnderground didn't work for me, did anyone get it to work? The artists must be the "found" 16.
no, lostartunderground does not work for me, either. That's $800 for the set. What a deal. I don't know Thunderstorm- everything I saw from Hollywood Bob, I've posted in the comments above. I didn't even get the "lostartunderground" tweet...why? ok just got it...doesn't work for me either. Scoutpost: He posted it about 12 min. ago. Said there were two sites. An ARG should/could be simple, cheap and easy. You could do it with one website and one writer...you don't need fancy graphics, gimmicks or any of that, just a story that ties into the actual show, officially. A puzzle. Isn't that all that people want? Oh, well, maybe there's something else on the horizon besides this. He wasn't sure if he heard it right. I doubt it Thunderstorm. At comic con they said it was all about the fans and they seem to have had that in mind when they commissioned this art. I think it's this and LU and that's it! Not trying to be negative, folks, it's just a little underwhelming. I do have to say that the Hurley painting is really cool. Thunderstorm: Yes, this is definitely disappointing to me. Seems like a lot of hype right now for selling DVD's (especially the Blu-Ray version) and now paintings of "fanart" from professional artists. Like I said before, where is that $50 going? Into the artist's pockets or to some charity? They're also auctioning off set pieces/props in May...guess they want fans to take a little piece of LOST with them when they go. I guess each reveal of the artworks might be interesting. But something tells me, by tomorrow that print will be in the first frame on the new DC&PB. Well, time to call it a night....glad I didn't go to Bardot's! Yeah, at least I know not to stay up for these things anymore...I can wait until morning. The Mysteries of the Universe thing is still out there, right? Maybe they will give us some 'TRUE' easter eggs inside of it. I really dig the 'In Search Of...' vibe of it. Yeah the Mysteries of the Universe thing is neat...but they have said that the Dharma Initiative won't play a role in S6...so I don't expect too much from it. Think I'm going to take my underwhelmed self to bed as well. Good night all! After what seems to be an anti climax, I've created a NEW POST. I think there were (maybe) 3 clues that no one picked up on. first When "Little Ben" appeared, he is in a "hoodie". Does that mean this is "evil little Ben"?????? On the main "painting" page, it looks like there is room for a few more paintings to be hung. So 16 may not be the number (yes I know it is one of "the" numbers - so my therory may not work). Also on DC&aPB.com they say "the coolest part of the fun, can be achieved just by s taying in your house. No need to stand up, get dressed and start flailing your arms to your waiting car". So most of what ever happens is going to be presented to us via the web. Hey that's me in the last photo! I'm glad you find me amusing =D. I'd like to think I'm a fun person hahahah.